Our Upholstery Cleaning Experts service Dallas, Richardson, Plano, McKinney, Frisco, Lewisville, Coppell & all surrounding DFW areas. Did you know that getting your upholstery cleaned could make your furniture look new again? Don’t replace your favorite furniture, let us restore the beauty and extend the life of your favorite furniture! With our commercial grade upholstery cleaning system your sofa, loveseat, recliner or any other piece of furniture can look near new again. So don’t go out and buy new furniture, and don’t be embarrassed when your friends and family visit. 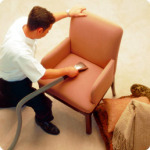 Contact our Residential & Commercial Upholstery Cleaning Service Professional in Dallas / Collin County, TX today! Upholstered furniture has a wide range of materials and manufacturing methods. Our professionally trained technicians will identify the fabric type of each upholstered piece, and use the cleaning method that will give your upholstery the best, safest and longest lasting results.